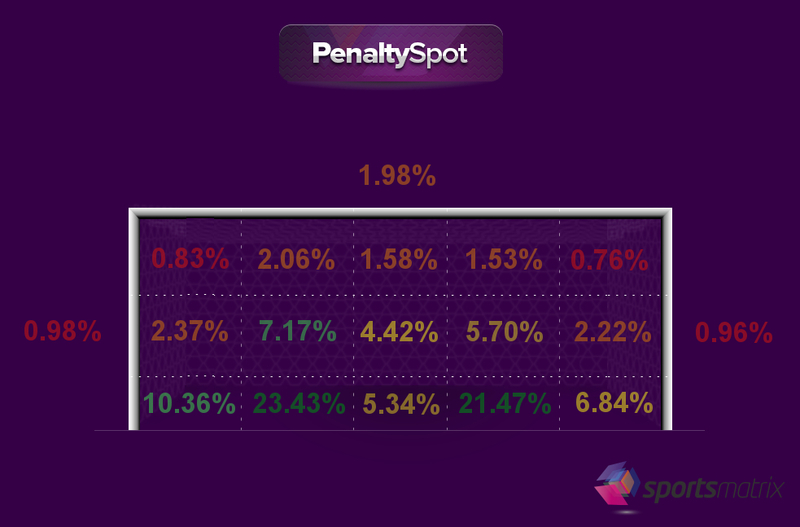 sportsmatrix » How Effective Are Penalty Kick Statistics? Just how important is the art of taking and stopping a penalty kick and does advanced knowledge of the goalkeeper or penalty taker really make a significant difference to the outcome of a game? In the 2014 World Cup semi-final and after 120 minutes of deadlock, Argentina and the Netherlands faced the dreaded penalty shootout. Step forward Argentina goalkeeper Sergio Romero, who at that time has a success rate of 19% at saving penalties; yet successfully saved two of the four Netherlands penalty kicks. Why was he so successful? Preparation. Before each kick, he took a note from his shorts which showed him the direction that each of the takers was likely to strike the ball to. Based on this example it’s reasonable to assume that having accurate information on opposition penalties should help improve a team’s chances of succeeding in a shootout. A penalty kick taken during the game is one of the best goal scoring opportunities that a team will receive and may sometimes prove to be crucial to the outcome of that game; but when examining knock out games from major international tournaments which were decided by a penalty shootout, it becomes apparent quite how critical penalty kicks really are. Since the introduction of penalty shootouts in the 1976 UEFA European Championship, there have been 50 knockout games, with 15 going to a penalty shootout (30%). The first penalty shootouts in the World Cup were in 1978 and since then in 134 knockout games, 26 ended with a penalty shootout (20%). Penalty shootouts were introduced to the Copa American in 1993. Since then 72 games reached the knockout stage, with 21 settled by penalty kicks (29%). After examining all penalties, the data was broken down into left and right footed penalty takers, to see whether there were any clear patterns as to where the shot was struck. The data clearly reveals that left footed penalty takers prefer shooting to the right and right footed penalty takers shoot left, presumably because shooting to the opposite direction enables the shot to be struck with greater power. Which direction do goalkeepers tend to dive? There is a tendency for goalkeepers to dive to the right, perhaps because most penalty takers are right footed and as shown above, strike their shots to the left (the goalkeeper’s right). An alternative explanation may be that most goalkeepers are right biased, making it easier for them to dive that way. Do they dive the right way? We divided the goal into three distinct parts, the left, the right and the centre. If the goalkeeper failed to move in the right direction of the kick, the decision was regarded as wrong. Even in a scenario where the keeper dived the wrong way, but still saved the shot with his feet, the goalkeeper’s dive was still deemed as being wrong. After examining all penalties, the data revealed that goalkeepers were statistically more likely to dive the wrong way. The penalty taker may attempt to trick the goalkeeper to go one way and dispatch a shot the other; whilst a percentage of takers wait to see if the goalkeeper commits to moving to a particular side. Whether it’s a reflex action or maybe instinct, based on this data it is apparent that goalkeepers mostly gamble as to which side to dive. The data reveals that the average success rate from penalties is 78.12%; however that figure is significantly reduced in a shootout. This can be put down to a number of factors, notably that some players who take penalties in shootouts would not normally take penalty kicks for their team. Just as significant is the intense pressure when taking penalties in a shootout situation. When the shootout reaches sudden death, then the rate of success continues to drop. When there is relatively little pressure, a penalty taker may try something different. Would Messi have attempted to pass the ball to Suarez from the penalty spot if the scores had been level and the game was in the closing minutes? But when the stakes are higher, by default most players automatically revert to their comfort zone. For the purpose of this report a high pressure penalty is defined as a penalty taken where either the scores are level or the team trail by one goal with the game entering the final 20 minutes. In a shootout scenario a high pressure penalty is defined as the penalty which has to be scored to prevent the opposition from winning the game or is the sudden death penalty which will decide the outcome of the game. When it comes to taking a crucial penalty – match saving or match winning – we examined all past penalties taken by the same player to determine which side was favoured (In excess of 50% of penalties struck to a particular side) and found out that where the pressure was at its most intense, more than 70% of penalty takers struck their penalty to their favoured side. The unpredictability and dynamism of football plus numerous external factors and variables affecting a game, make it extremely difficult to analyse; however one of the few static situations in the game of football is the penalty kick. A player shooting from 12 yards, the goalkeeper standing on the goal line and for each a limited number of decisions to be taken. This is perhaps the most obvious situation in a game where statistical analysis can make a difference between success and failure; so it should come as no real surprise that an increasing number of clubs and national teams are making a significant investment for something apparently as minor yet as critical as penalties. It is clear that penalties often play a key role in deciding the outcome of a game and in a shootout scenario, entire tournaments, including knockout games have been decided by the team which held its nerve from 12 yards. Historical data of a player’s habits at penalty kicks in a high percentage of cases improves the chances of predicting the player’s actions in a high percentage of cases. So the team which arrives in a penalty shootout not fully prepared, has less chance of succeeding.